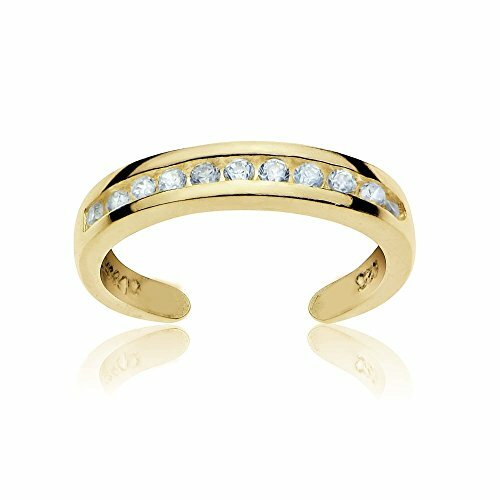 This chic toe ring displays channel set CZ stones in polished yellow gold flashed sterling silver. The toe ring is available in one size and the open ends make slightly adjustable. Gemstar USA provides an awesome variety of styles and design such as Bracelets for Women, Bracelets for Teen Girls, Earrings for Women, Necklaces for Women, Necklaces for Teen Girls, Rings for Women and Rings for Teen Girls! FEATURE - This fine toe ring displays channel set CZ stones in polished sterling silver. Wear them in the sandy beaches or on a very hot sunny day. This fine toe ring is a great addition to your fine jewelry, fashion jewelry, trendy jewelry or beach jewelry collections. They can be purchased as toe rings for women, toe rings for girls or toe rings for teens. CRAFTED - The toe ring is crafted of yellow gold flash sterling silver; it is nickel free. It is available in one size, the open ends make it slightly adjustable.